For other people named Gene McCarthy, see Gene McCarthy (disambiguation). Born in Watkins, Minnesota, McCarthy became an economics professor after earning a graduate degree from the University of Minnesota. He served as a codebreaker for the United States Department of War during World War II. McCarthy became a member of the Minnesota Democratic–Farmer–Labor Party (the state affiliate of the Democratic Party) and won election to the House of Representatives in 1948. He served until winning election to the Senate in 1958. McCarthy was a prominent supporter of Adlai Stevenson II for the Democratic presidential nomination in 1960 and was himself a candidate for the Democratic vice presidential nomination in 1964. He co-sponsored the Immigration and Nationality Act of 1965, though he later expressed regret about the impact of the bill and became a member of the Federation for American Immigration Reform. As the 1960s progressed, McCarthy emerged as a prominent opponent of President Johnson's handling of the Vietnam War. After Robert Kennedy declined the request of a group of anti-war Democrats to challenge Johnson in the 1968 Democratic primaries, McCarthy entered the race on an anti-war platform. Though he was initially given little chance of winning, the Tet Offensive galvanized opposition to the war and McCarthy finished in a strong second place in the New Hampshire primary. After that primary election, Kennedy entered the race and Johnson announced that he would not seek re-election. McCarthy and Kennedy each won several primaries before Kennedy was assassinated in June 1968. The 1968 Democratic National Convention chose Vice President Hubert Humphrey, Johnson's preferred candidate, as its presidential nominee. McCarthy did not seek re-election in the 1970 Senate election. He sought the Democratic presidential nomination in 1972 but fared poorly in the primaries. He ran in several more races after that, but never won election to another office. He ran as independent in the 1976 presidential election and won 0.9% of the popular vote. He was a plaintiff in the landmark campaign finance case of Buckley v. Valeo and supported Ronald Reagan in the 1980 presidential election. McCarthy was born in Watkins, Minnesota. He was the son of a deeply religious Roman Catholic mother of German ancestry, Anna Baden McCarthy, and strong-willed father of Irish descent, Michael J. McCarthy, who was a postmaster and cattle buyer. McCarthy grew up in Watkins with his parents and three siblings. He attended St. Anthony's Catholic School in Watkins, and spent hours reading his aunt's Harvard Classics. He was influenced by the monks at nearby St. John's Abbey and University in Collegeville, Minnesota, and attended prep school there, at Saint John's Preparatory School, from which he graduated in 1932. He also went to college at Saint John's University, graduating in 1935. McCarthy earned his master's degree from the University of Minnesota in 1939. He taught in public schools in Minnesota and North Dakota from 1935 to 1940, when he became a professor of economics and education at St. John's, working there from 1940-43. In 1943, considering the contemplative life of a monk, he became a Benedictine novice at Saint John's Abbey. After nine months as a monk he left the monastery, causing a fellow novice to say, "It was like losing a 20-game winner". He enlisted in the Army, serving as a code breaker for the Military Intelligence Division of the War Department in Washington, D.C. in 1944. He was then an instructor in sociology and economics at the College of St. Thomas, St. Paul, Minnesota from 1946-49. McCarthy became a member of the Minnesota Democratic-Farmer-Labor Party. In 1948 he won election to the United States House of Representatives with labor and Catholic support, representing Minnesota's 4th congressional district until 1959. He became the leader of young liberals, predominately from the Midwest, called "McCarthy's Marauders". In 1952 he engaged Wisconsin Senator Joseph McCarthy (no relation) in a nationally televised debate in which he parodied the Senator's arguments to "prove" that General Douglas MacArthur had been a communist pawn. In 1958 he won election to the U.S. Senate. He served as a member of (among other committees) the powerful Senate Foreign Relations Committee. McCarthy became known to a larger audience in 1960 when he supported twice-defeated presidential candidate Adlai Stevenson for the Democratic nomination. He pleaded during his speech, "Do not reject this man who made us all proud to be called Democrats!" He joked about his own merits as a candidate, "I'm twice as liberal as Hubert Humphrey, twice as intelligent as Stuart Symington, and twice as Catholic as Jack Kennedy." He was considered as a possible running mate for Lyndon Johnson in 1964, only to see fellow Minnesota Senator Humphrey chosen for that position. Along with Ted Kennedy, McCarthy was one of the original co-sponsors of the Immigration Act of 1965. He later regretted this, noting that "unrecognized by virtually all of the bill's supporters, were provisions which would eventually lead to unprecedented growth in numbers and the transfer of policy control from the elected representatives of the American people to individuals wishing to bring relatives to this country". Taking a turn to the right, McCarthy became a member of the Board of Advisors of the Federation for American Immigration Reform. McCarthy met with Marxist-Leninist revolutionary Che Guevara in New York City in 1964 to discuss repairing relations between the US and Cuba. The two met in journalist Lisa Howard's apartment on Park Avenue in Manhattan. The film Che: Part One depicts this event. In 1968, Allard K. Lowenstein and his anti-Vietnam War Dump Johnson movement recruited McCarthy to run against incumbent President Lyndon B. Johnson. Reportedly, Lowenstein first attempted to recruit Senator Robert F. Kennedy, who declined to run, then Senator George McGovern, who also declined to run against Johnson (Kennedy would decide to run after the primary on March 16, 1968, and McGovern also later briefly entered the race). McCarthy entered and almost defeated Johnson in the New Hampshire Democratic primary, with the intention of influencing the federal government — then controlled by Democrats — to curtail its involvement in the Vietnam War. A number of anti-war college students and other activists from around the country traveled to New Hampshire to support McCarthy's campaign. Some anti-war students who had the long-haired, counterculture appearance of hippies chose to cut their long hair and shave off their beards, in order to campaign for McCarthy door-to-door, a phenomenon that led to the informal slogan "Get clean for Gene". McCarthy's decision to run arose partly as an outcome of opposition to the war by Wayne Morse of Oregon, one of the two Senators to vote against the Gulf of Tonkin Resolution of August 1964. Morse gave speeches denouncing the war before it had entered the consciousness of most Americans. Following that, several politically active Oregon Democrats asked Robert Kennedy to run as an anti-war candidate. McCarthy had also encouraged Kennedy to run as well. Initially Kennedy refused, so the group asked McCarthy to run, and he responded favorably. After Kennedy entered the race and Johnson withdrew, however, McCarthy shifted his focus towards the New York Senator. McCarthy declared his candidacy on November 30, 1967, saying, "I am concerned that the Administration seems to have set no limit to the price it is willing to pay for a military victory." Political experts and the news media dismissed his candidacy, and he was given little chance of making any impact against Johnson in the primaries. But public perception of him changed following the Tet Offensive (January 30-February 23, 1968), the aftermath of which saw many Democrats grow disillusioned with the war, and quite a few interested in an alternative to LBJ. McCarthy said, "My decision to challenge the President's position and the administration's position has been strengthened by recent announcements out of the administration. The evident intention to escalate and to intensify the war in Vietnam, and on the other hand, the absence of any positive indication or suggestion for a compromise or for a negotiated political settlement." On December 3, 1967 Senator McCarthy addressed The Conference of Concerned Democrats in Chicago, accusing the current administration of ignoring and bungling opportunities for bring the war to a conclusion,. On February 17, 1968 it was reported that McCarthy's campaign had only raised one quarter of the funds it had hoped to raise nationally. On May 11, 1968 McCarthy's questionable record on Civil Rights was attacked by Senator Robert Kennedy. As his volunteers (led by youth coordinator Sam Brown) went door to door in New Hampshire, and as the media began paying more serious attention to the Senator, McCarthy began to rise in the opinion polls. When McCarthy scored 42% to Johnson's 49% in the New Hampshire popular vote (and 20 of the 24 N.H. delegates to the Democratic national nominating convention) on March 12 it became clear that deep division existed among Democrats on the war issue. By this time, Johnson had become inextricably defined by Vietnam, and this demonstration of divided support within his party meant his reelection (only four years after winning the highest percentage of the popular vote in modern history) seemed unlikely. The folk trio Peter, Paul and Mary released a record "Eugene McCarthy For President (If You Love Your Country)", endorsing McCarthy, who they said had stood alone against Johnson over "more timid men" now echoing him. On March 16, Kennedy announced that he would run; many Democrats saw Kennedy as a stronger candidate than McCarthy. On March 31, in a surprise move, Johnson announced that he would not seek reelection. Following that, McCarthy won in Wisconsin, where the Kennedy campaign was still getting organized. McCarthy also won in Oregon against a well-organized Kennedy effort; it was even considered his first official victory over Kennedy as well. Even as McCarthy styled himself the clean politician, however, he dished it out, too. Known for his wit, when asked if Michigan governor George Romney's comment that he had been "brainwashed" about the Vietnam War had ended his presidential hopes, McCarthy remarked, "Well . . . er no, not really. Anyway, I think in that case a light rinse would have been sufficient." He mocked Robert Kennedy and his supporters. A major gaffe occurred in Oregon, when McCarthy sniffed that Kennedy supporters were "less intelligent" than his own and belittled Indiana (which had by then gone for Kennedy) for lacking a poet of the stature of Robert Lowell—a friend of McCarthy's who often traveled with him. Some of those who joined McCarthy's effort early on were Kennedy loyalists. Now that Kennedy was in the race, many of them jumped ship to his campaign, urging McCarthy to drop out and support Kennedy for the nomination. However, McCarthy resented the fact that Bobby had let him do the "dirty work" of challenging Johnson, and then only entered the race once it became apparent that the President was vulnerable. As a result, while he initially entered the campaign with few illusions of winning, McCarthy now devoted himself to beating Kennedy (and Hubert Humphrey, who entered the race after LBJ removed himself), and gaining the nomination. Kennedy, like his brother before him, planned to win the nomination through popular support in the primaries. McCarthy and Kennedy squared off in California, each knowing that the state would make or break them. They both campaigned vigorously up and down the state, with many polls showing them neck-and-neck, and a few even predicting a McCarthy victory. However, a televised debate between them began to tilt undecided voters away from the Minnesota Senator. McCarthy made two ill-considered statements: That he would accept a coalition government including Communists in Saigon, and that only the relocation of inner-city blacks would solve the urban problem. Kennedy pounced, portraying the former idea as soft on communism, and the latter diagnosis as a scheme to bus tens of thousands of ghetto residents into white, conservative Orange County. Kennedy took the crucial California primary on June 4, but was shot after his victory speech at the Ambassador Hotel in Los Angeles, and died soon afterwards. In response, McCarthy refrained from political action for several days, but did not remove himself from the race. One aide recalled him sneering about his fallen rival, "Demagoguing to the last". Another heard him say that Kennedy "brought it on himself"—implying that because Kennedy had promised military support to the state of Israel, he had somehow provoked Sirhan Sirhan, the Palestinian gunman convicted of killing him. Despite strong showings in several primaries — indeed, he won more votes than any other Democratic candidate — McCarthy garnered only 23 percent of the delegates at the 1968 Democratic National Convention, largely due to the control of state-party organizations over the delegate-selection process. After the Kennedy assassination, many delegates for Kennedy chose to support George McGovern rather than McCarthy. Moreover, although the eventual nominee, Vice President Hubert Humphrey, was not clearly an anti-war candidate, some anti-war Democrats hoped that Humphrey as President might succeed where Johnson had failed — in extricating the United States from Vietnam. McCarthy eventually gave a lukewarm endorsement of Humphrey. Although McCarthy did not win the Democratic nomination, the anti-war "New Party", which ran several candidates for President that year, listed him as their nominee on the ballot in Arizona, where he received 2,751 votes. He also received 20,721 votes as a write-in candidate in California. Illinois was the only primary in which McCarthy actively participated. He got 38% of the vote against the, then, leading contender Edmund Muskie's 59% (3% of others). A better showing than McGovern got against Muskie two weeks earlier in New Hampshire. But McCarthy's Illinois campaign was ignored by the media. After the 1972 campaign, he left the Democratic Party, and ran as an Independent candidate for President in the 1976 election. During that campaign, he took a libertarian stance on civil liberties, promised to create full employment by shortening the work week, came out in favor of nuclear disarmament, attacked the Internal Revenue Service, and declared whom he would nominate to various Cabinet postings if elected. Mainly, however, he battled ballot access laws that he deemed too restrictive and encouraged voters to reject the two-party system. His numerous legal battles during the course of the election, along with a strong grassroots effort in friendly states, allowed him to appear on the ballot in 30 states and eased ballot access for later third party candidates. His party affiliation was listed on ballots, variously, as "Independent," "McCarthy '76," "Non-Partisan," "Nom. Petition," "Nomination," "Not Designated," and "Court Order". Although he was not listed on the ballot in California and Wyoming, he was recognized as a write-in candidate in those states. In many states, he did not run with a vice presidential nominee, but he came to have a total of 15 running mates in states where he was required to have one. At least eight of his running mates were women. Nationally, McCarthy received 740,460 votes for 0.91% of the total vote finishing third in the election. His best showing came in Oregon where he received 40,207 votes for 3.90% of the vote. He opposed Watergate-era campaign finance laws, becoming a plaintiff in the landmark case of Buckley v. Valeo, 424 U.S. 1 (1976), in which the U.S. Supreme Court held that certain provisions of federal campaign finance laws were unconstitutional. McCarthy, along with the New York Civil Liberties Union, philanthropist Stewart Mott, the Conservative Party of New York State, the Mississippi Republican Party, and the Libertarian Party, were the plaintiffs in Buckley, becoming key players in killing campaign spending limits and public financing of political campaigns. In 1980, dismayed by what he saw as the abject failure of the Jimmy Carter presidency (he would later say "he was the worst president we ever had"), he appeared in a campaign ad for Libertarian candidate Ed Clark, and also wrote the introduction to Clark's campaign book. He eventually endorsed Ronald Reagan for the presidency. In 1982, he ran for the U.S Senate but lost the Democratic primary to businessman Mark Dayton by 69% to 24%. In the 1988 election, his name appeared on the ballot as the presidential candidate of a handful of left-wing state parties, specifically the Consumer Parties in Pennsylvania and New Jersey and the Minnesota Progressive Party in Minnesota. In his campaign he supported trade protectionism, Reagan's Strategic Defense Initiative and the abolition of the two-party system. He received 30,905 votes. In 1992, returning to the Democratic Party, he entered the New Hampshire primary and campaigned for the Democratic Presidential nomination, but was excluded from the first and therefore most important televised debate by its moderator, Tom Brokaw of NBC. McCarthy, along with other candidates who had been excluded from the 1992 Democratic debates (including two-time New Alliance Party Presidential candidate Lenora Fulani, former Irvine, California mayor Larry Agran, Billy Jack actor Tom Laughlin, and others) staged protests and unsuccessfully took legal action in an attempt to be included in the debates. Unlike the other excluded candidates mentioned, McCarthy was a longstanding national figure and had mounted credible campaigns for President in previous elections. McCarthy ended up winning 108,679 votes in the 1992 primaries. McCarthy and his wife, Abigail Quigley McCarthy, had five children, Christopher Joseph McCarthy (April 30, 1946 – April 30, 1946), Eleanor McCarthy Howell, Mary Abigail McCarthy (April 29, 1949 – July 28, 1990), Michael Benet McCarthy, and Margaret Alice McCarthy. In 1969, McCarthy left his wife after 24 years of marriage, but the two never divorced. McCarthy was a restless, moody, and often caustic man who neglected his family for politics, and the couple had led largely separate lives for the majority of their 24 years together. The young McCarthy children stayed with their mother following the separation. According to Dominic Sandbrook, McCarthy biographer, it was CBS News correspondent Marya McLaughlin (December 29, 1929 – September 14, 1998) with whom McCarthy was actually involved in a long-term relationship that lasted until McLaughlin's death in 1998. McCarthy died of complications from Parkinson's disease at the age of 89 on December 10, 2005, in a retirement home in Georgetown, Washington, D.C., where he had lived for the previous few years. His eulogy was given by former President Bill Clinton. Following his death the College of Saint Benedict and Saint John's University dedicated their Public Policy Center the Eugene J. McCarthy Center for Public Policy. The Democratic party memorialized his death during the 2008 Democratic National Convention in Denver, Colorado, on August 28, 2008. The memorial included pictures of several prominent Democrats who had died during the 4-year period since the 2004 Convention displayed on a large screen. During Senator McCarthy's tribute, the screen displaying his photograph left off his first name but included his middle name, calling him "Senator Joseph McCarthy"; Joseph McCarthy was a notable Republican Senator from Wisconsin famous for his anti-Communist campaigning and sparring with journalist Edward R. Murrow. In 2009, his alma mater, St. John's University, honored McCarthy by establishing the Eugene McCarthy Distinguished Public Service Award. McCarthy's files as U.S. congressman (Democratic Farmer-Labor) from Minnesota's fourth district (1949–1958) and as U.S. senator from Minnesota (1959–1970) are available for research use. They include executive files, general files, legislative files, personal files, political and campaign (including senatorial, vice presidential, and presidential) files, public relations files, sound and visual materials (with photographs), and speeches. ^ Eugene McCarthy Obituary | Eugene McCarthy Funeral | Legacy.com Retrieved 2018-05-11. ^ a b c O’Donnell, Lawrence (2017). Playing with Fire – The 1968 Elections and the Transformation of American Politics (1st ed.). Penguin Press. ISBN 9780399563140. ^ Post, Tim (2006-01-24). "St. John's remembers Sen. Eugene McCarthy". Minnesota Public Radio. Retrieved June 14, 2017. ^ Sandbrook, Dominic (2007). 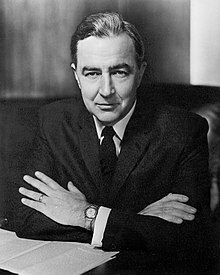 Eugene McCarthy: The Rise and Fall of Postwar American Liberalism. Knopf Doubleday Publishing Group. p. 3. ISBN 9780307425775. ^ Roske, Peggy (2010). "Eugene McCarthy's Days at St. John's" (PDF). Retrieved May 4, 2016. ^ Eisele, Albert (December 13, 2005). ws/10430-his-time-was-then--and-now "His time was then — and now" Check |url= value (help). TheHill.com. Retrieved January 29, 2016. ^ "Who is Eugene J. McCarthy? â€" CSB/SJU". www.csbsju.edu. College of Saint Benedict/Saint John's University. Retrieved 2017-06-15. ^ Lubell, Samuel (1956). The Future of American Politics (2nd ed.). Anchor Press. p. 223. ^ a b c d Senator Eugene McCarthy obituary, telegraph.co.uk, December 12, 2005. ^ "Eugene McCarthy". Times of London. 2005-12-12. Retrieved 2011-03-30. ^ "A Personal Note on the Passing of Eugene McCarthy" (PDF). December 2005/January 2006 Immigration Report. Federation for American Immigration Reform. 2006. Retrieved January 29, 2016. ^ Eisele, Al (2009-03-25) "When Gene McCarthy Met Che Guevara", Huffington Post; retrieved 2010-01-29. ^ "Remembering Eugene McCarthy". NPR. Retrieved September 2, 2016. ^ Marlow, James (1967-12-01). "McCarthy Is Unlikely to Alter LBJ Policy". Kentucky New Era. Hopkinsville, Kentucky. Associated Press. p. 4. Retrieved 2015-06-14 – via Google News Archive. At this point it is not likely many people, including McCarthy, think he has a chance to get the nomination away from Johnson although, if he can generate enough heat, somebody else might. ^ "1967 Year In Review". UPI.com. ^ "Message of fear attributed to LBJ". Lewiston Morning Tribune. December 3, 1967 – via Google News Archive. ^ "McCarthy urges letting Cong have some Southern Districts". Lewiston Morning Tribune. December 11, 1967 – via Google News Archive. ^ Allen, Robert S. (February 17, 1968). "Senate Ethics Committee Dragging Feed". The Lewiston Daily Sun – via Google News Archive. ^ Allen, Robert S. (May 11, 1968). "McCarthy did vote against Poll Tax repeal". Lewiston Daily Sun. p. 3 – via Google News Archive. ^ "The Lewiston Daily Sun - Google News Archive Search". ^ "1968 45-RPM Eugene McCarthy Campaign Recording: Peter, Paul, & Mary". YouTube. 2010-09-04. Retrieved 2017-06-15. ^ Lewis Chester; Godfrey Hodgson; Bruce Page (1969). An American melodrama: the presidential campaign of 1968. Viking Press. p. 101. Retrieved 15 May 2013.
as cited in: Campbell, W. Joseph (September 4, 2012). "Recalling George Romney's "brainwashing" and Gene McCarthy's "light rinse" retort". Media Myth Alert. Retrieved May 16, 2013. ^ a b c Greenberg, David (June 4, 2008). "After the Assassination: How Gene McCarthy's response to Bobby Kennedy's murder crippled the Democrats". Slate.com. Retrieved January 29, 2016. ^ Walker, Jesse (2009-11-01) "Five Faces of Jerry Brown", The American Conservative, November 1, 2009. ^ "Eugene McCarthy for President 1976 Campaign Brochure". 4president.org. 2007-09-22. Retrieved 2017-06-15. ^ a b c Leip, David (2005). "1976 Presidential General Election Results". Atlas of U.S. Presidential Elections. ^ Hitchens, Christopher (2007-05-21). "The latest absurdities to emerge from Jimmy Carter's big, smug mouth. - By Christopher Hitchens - Slate Magazine". Slate.com. Retrieved 2010-07-20. ^ MacNeil-Lehrer NewsHour (2005-12-12). Online NewsHour: Remembering Sen. Eugene McCarthy — December 12, 2005. PBS. ^ Cline, Francis X. (December 11, 2005). "Eugene J. McCarthy, Senate Dove Who Jolted '68 Race, Dies at 89". The New York Times. Retrieved January 29, 2016. ^ Leip, David (2005). "1988 Presidential General Election Results". Atlas of U.S. Presidential Elections. ^ Leip, David (2016). "1992 Presidential General Election Results". Atlas of U.S. Presidential Elections. ^ Sandbrook, Dominic (2007-12-18). Eugene McCarthy: The Rise and Fall of Postwar American Liberalism. Knopf Doubleday Publishing Group. ISBN 9780307425775. ^ "Paid Notice: Deaths MCLAUGHLIN, MARYA - The New York Times". Nytimes.com. 1998-09-16. Retrieved 2017-06-15. ^ "Marya McLaughlin Dead At 68". CBSNews.com. September 16, 1998. Retrieved January 29, 2016. ^ "The Eugene J. McCarthy Center for Public Policy and Civic Engagement". College of Saint Benedict. Retrieved 2007-09-06. ^ "Dems Confuse Joe, Eugene McCarthy". NPR.org. August 27, 2008. Retrieved 2008-08-29. ^ "Eugene McCarthy Public Service Award". The Eugene J. McCarthy Center. Retrieved October 5, 2014. ^ Eugene J. McCarthy Papers at Minnesota Historical Society; accessed June 14, 2017. Dominic Sandbrook, Eugene McCarthy and The Rise and Fall of American Liberalism (2005). "No Success Like Failure." by Jon Wiener. The Nation, May 3, 2004, 50–53.